Of the ten Joplin school district buildings damaged or destroyed in the May 2011 tornado the largest was the high school. Now, a massive new $110 million high school and tech campus is taking shape on the same site. The cost is covered by insurance, government grants, donations and a portion of the $62 million school bond approved by voters in 2012. The new campus should be ready in time for the start of the new school year in August, but construction has reached a point where, with the help of a little computer graphic magic, we can finally get a tour of the facility. For two and a half years Joplin High School students have been divided between two temporary schools. Ninth and tenth grade grade students attend class at the former Memorial Middle School, eleventh and twelfth grade students go to school in space adapted from a former store at the Northpark Mall. The mall space has been adequate but far from ideal. "More windows," says high school junior Saniya Ablatt. "Definitely, I'd love more windows. More walls that maybe don't move." "We're lacking a lot of students, like the freshmen and sophomores - the high school experience is a lot about influencing the younger generation," says junior Jaxon Meredith. "A thousand people put into what basically used to be a department store, definitely has a cramped feeling," says junior Tanner Munson. Solutions to all those concerns are coming. Artists renditions are the best images we've had to this point of the new high school. But what had been just a concept is now becoming a reality -- real enough for us to finally get an actual tour of the building under construction. High School Principal Dr. Kerry Sachetta took us on a tour through the space that will be the main east entry. It's designed to be wide open and inviting. "Your first impression needs to be a good impression as you well know," Dr. Sachetta says. A light-filled staircase rises from the main east entry and introduces a theme used throughout the campus -- plenty of expansive, multi-use spaces with massive windows. "I think it would be very hard to find very many spaces where there isn't some natural light coming into the building." Broad walkways connect classrooms on the second and third levels. They also connect with the new Franklin Technology Center and open onto community areas, including one that will be much more than a typical cafeteria. "We want to give it a more restaurant feel, a more comfortable feel, a less institutional type feel," Dr. Sachetta says. "When kids get their food they're going to be able to sit at different kinds of tables; different kinds of booths." One open staircase below is the the multi-use gathering space known as Eagle Alley. "I think school is going to seem more different than just going to a classroom, shutting a door and learning with pencil and paper," Dr. Sachetta says. The campus will be made up essentially of a number of different buildings that will all be connected, largely through "skywalks", enclosed bridges that include lots of glass and wide open views. Two of those skywalks will connect to the largest of three gymnasiums. Spectators will enter from the upper level and access bleachers from the top. Those bleachers will be on three sides and seat up to 2,500 people. A running track above the bleachers will be flanked by large windows. Scattered amid all these wide open spaces will be more intimate places for escape -- a dozen or so "think tanks" or small glass-walled rooms. They're an idea borrowed from the mall high school. "Students can come in here and have quiet and they can collaborate on a project and activity", Dr. Sachetta says. "Small group instruction for instance. A teacher can bring two or three students in here and work with them as a group." High school juniors who have spent three school years in temporary facilities say they can hardly wait to move into their new facilities. "It's going to be so awesome to know that we're the first class graduating from this awesome school that Joplin's been able to build" says Sanija. "I actually think it's really exciting", Jaxon says. "I'm so ready to get in the new school." Tanner knows more than a building is coming together. "Finally being put together with other classes", he says, "is what I think will put Joplin into a good place. It's something the whole community should be proud of, and more importantly, our students should benefit greatly from it." 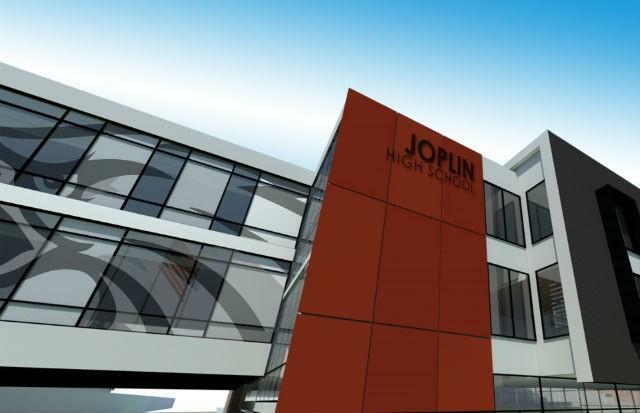 The new Joplin High School and Tech Center complex will be huge. When construction is complete the interconnected buildings that make up the campus will cover more than 400,000 square feet for nearly 2,500 students. That's just the interior spaces. The campus has been designed to also use plenty of outdoor areas. That will be a welcome change for students who've been attending classes in a temporary school with limited outdoor access and no views. Designers of Joplin's temporary mall high school used some innovative ideas to make the most of limited indoor space. But since it used to be a department store, it has no windows. "The only outside we ever really get to see here is when we're walking to and from the trailers," says high school junior Caroline Statler. The fact is, there's not much to see outside anyway. "Well, there's a tree", Caroline says laughing. "There's fences along the left side that have tarps up on them and on the other side there's a parking lot, and then you've got the view of the trailers." Caroline and her classmates will have a much better outdoor view when the new high school opens in time for the new school year. The campus will include lots of green spaces, landscaped with both aesthetics and academics in mind. One expansive area, called the Rose Garden, will be visible through large windows in the cafeteria and from the gathering space known as Eagle Alley. "It has been a tradition here," says Dr. Sachetta. "It's been in Joplin for over 40 years so we're going to recreate the rose garden right in here." The space will be secured by a movable fence that can be pulled shut and locked during school hours. One courtyard will have a seating area for theatre productions secure for evening performances under the lights and the stars. All of the outside spaces are intended to be both beautiful and functional. "The courtyards will be designed too as learning spaces," Dr. Sachetta says. "Each courtyard will have its own uniqueness so you can go out there and bring students out there. It'll be a nice space to sit and read if you want." "It makes it feel bigger," Caroline says. "So you're able to relax more and feel you've got more air." Soon, students confined to a building without windows and a small parking lot courtyard, will get a brand new school with a brand new look inside and out.